Lost: Loki went missing last night in Strasburg. She was last seen in the area of Taco Bell around 6:30pm. She did not have her collar on at the time she escaped the fence. She might not come to people that approach her. She is a good dog but she scares easily. Found: This beautiful girl was found in the Cross Street area of Newcomerstown. She had no collar or tags when she was found. Lost: Nikko has gone missing again. Area of Bank Lane SW and 2nd Street SW New Philadelphia. With that said someone in my neighborhood trapped him and dumped him on Crooked Run Road about 2 years ago! My fear is that the same thing happened again! He is black and neutered and declawed on all 4 paws (He came to us that way). His left ear is crumpled and doesn’t stand up very well. He is friendly and probably scared. 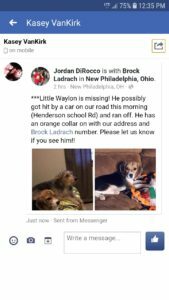 Lost: Little Waylon is missing! He possibly was hit by a car on Henderson School Rd New Phila and ran off. He has an orange collar on with address and phone number. This beautiful pup was found around Bunker Hill Rd and Frank Rd outside of Port Washington. Please call 330-340-4133.